AJS movie screening program of “Paper Lanterns” was held at White & Case Law Office with 70 people participated. It is an hour long documentary film with Mr. Shigeaki Mori as the main character, who was hugged by former President Obama during his visit to Hiroshima. It focuses on Mr. Mori’s lifelong searching for the bereaved families of 12 Americans, who lost their lives also by the atomic bombing in Hiroshima. 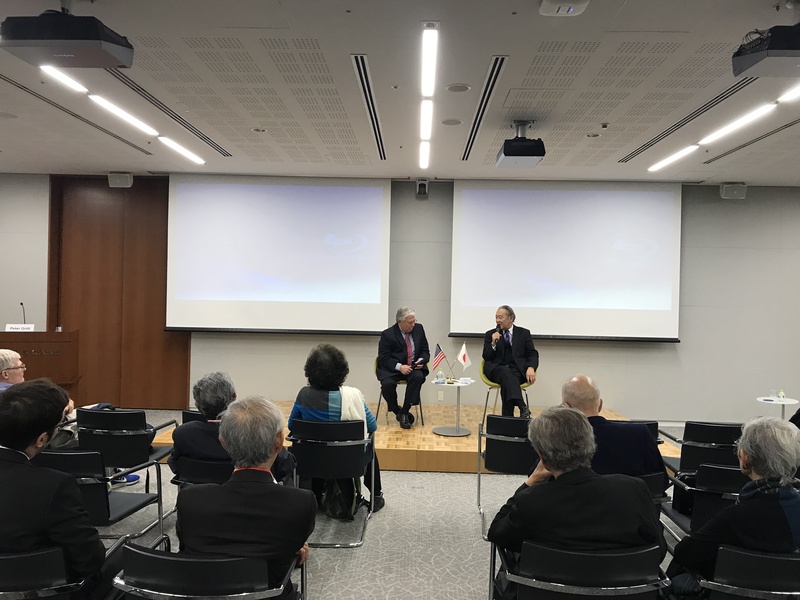 After the viewing, Mr. Peter Grilli, former President of The Japan Society of Boston also the producer of this movie, talked about behind story of the movie and conversed with President Fujisaki. There were many questions and comments from the participants, which made the session very active. I felt that there was a need for people inside and outside of Japan to watch this movie, and pass down the misery of war and the horror of the atomic bomb from generation to generation.